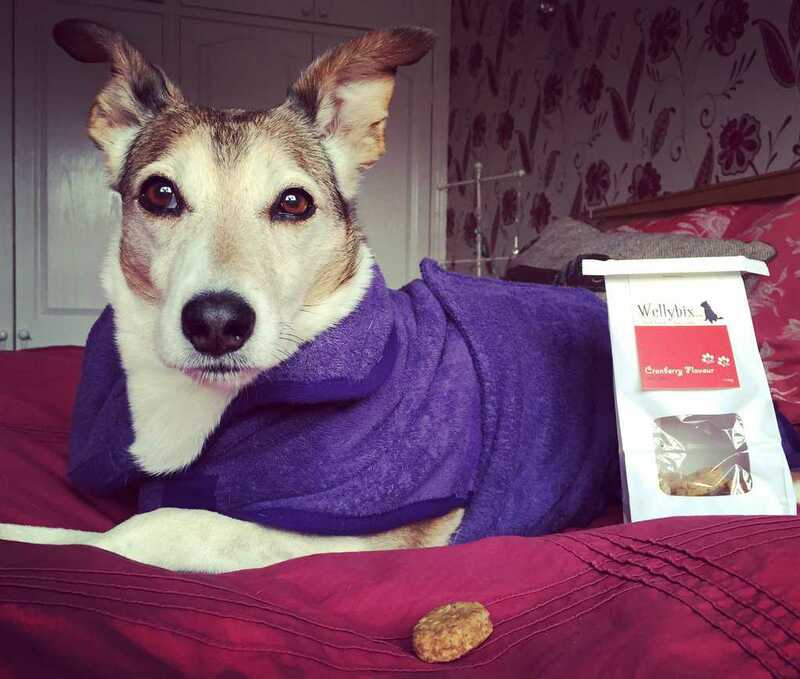 Poppy dog, like any canine on the planet, is never one to refuse a treat! However, she does have quite a sensitive tummy and I do have to be careful what I feed her (to avoid painful nights outside on the lawn – painful for both me and her!) 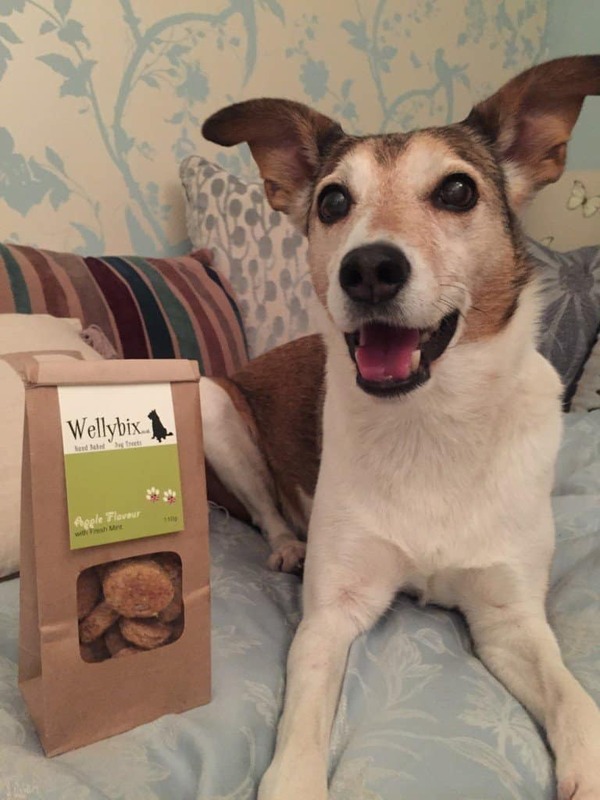 So secure in the knowledge that Wellybix biscuits are lovingly hand-baked using ingredients from Alison’s own garden, and are “completely free of any artificial flavours, colours and enhancers” I thought they were something that needed to be put to the Poppy taste test! 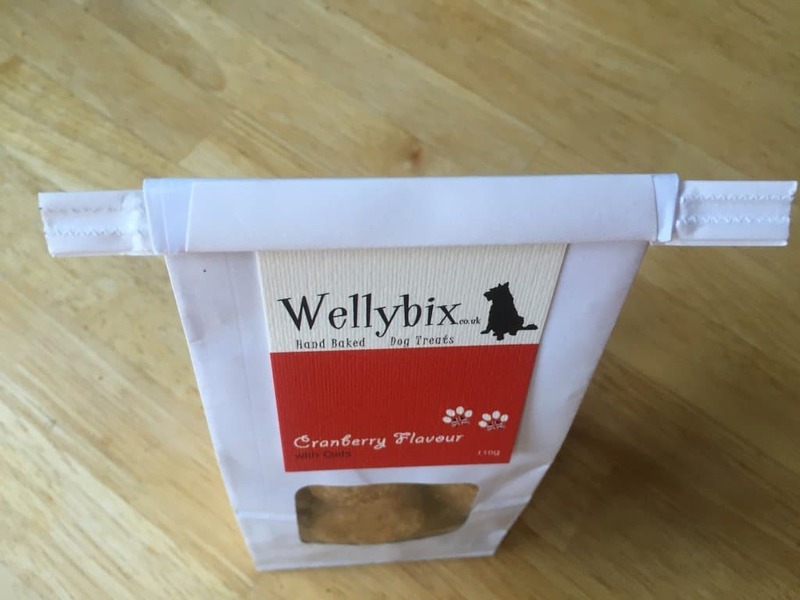 The first thing that impressed me about Wellybix, was the beautiful presentation of the packaging – they arrived (very promptly after placing the order I hasten to add) in a sturdy box (no fear of them being damaged by the Royal Mail!) and inside they were wrapped in beautiful ‘pawprint’ tissue paper, making them the perfect gift for any discerning pooch. Of course, like any present that arrives for Poppy dog, the wrapping paper was soon destroyed, impatient to test the tasty treats inside! The bags in which the treats are packaged is a very clever design and obviously carefully thought out. Each bag includes a robust ‘bag tie’ (for want of a better description) to keep the biscuits fresh and make resealing the packet an easy task. Bearing in mind I’m writing this blog in late January, and we still have a few treats (only a few!) left, they still appear to be just as tasty (according to the speed at which they are consumed) and just as crunchy too (according to the noisy consumption!) proving that the reseal function works a treat! I have to admit that the smell of these biscuits is also very tempting – you can tell they’re made from quality ingredients just by their aroma. The Apple treats (which I think were Poppy’s personal favourites) really did smell good enough to eat – even I was drooling, let alone Poppy dog! 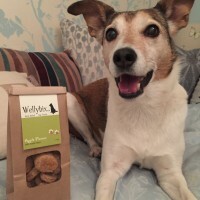 Poppy and I really can’t recommend Wellybix dog treats enough, they definitely receive a paws up from us and we think they are very reasonably priced too at just £3.35 (plus postage) a bag. Please check out their website, and treat your furry friend – they don’t just sell treats, they also sell beautiful Harris Tweed leads and collar sets (these are on Poppy’s wish list! ), along with an impressive selection of natural bath time products and the most adorable selection of greetings cards too. 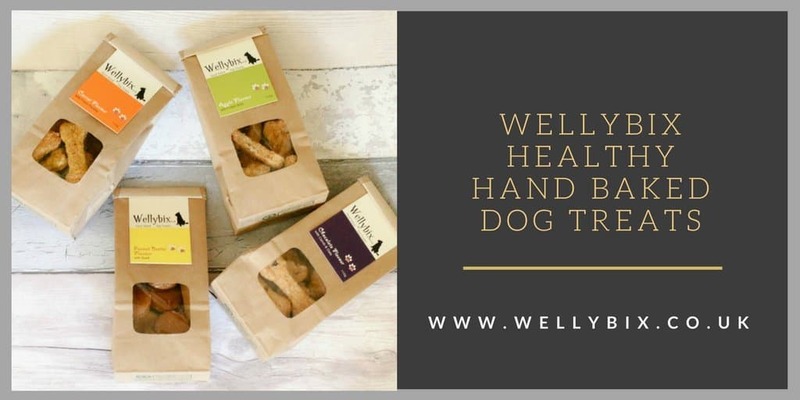 Thank you Alison and Welly for creating these delicious healthy treats. 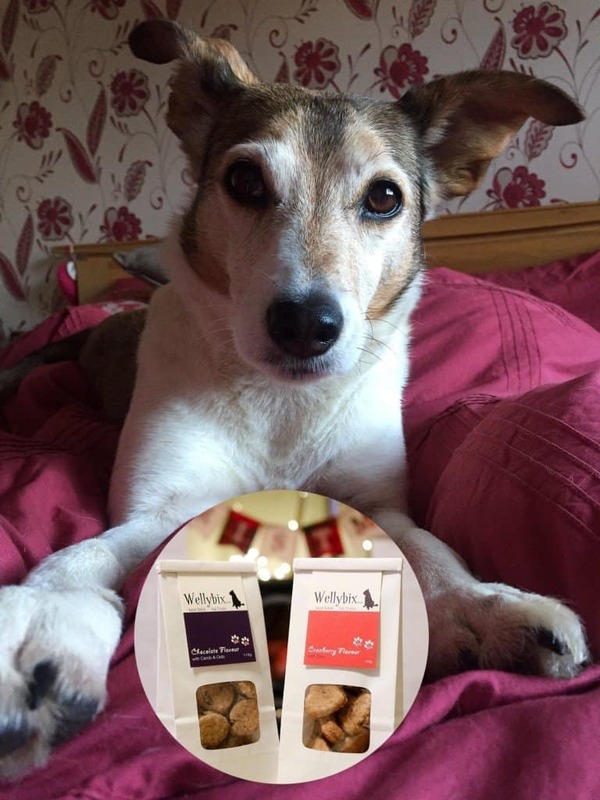 2 Responses to Wooftastic Wellybix Dog Biscuits! Thank you so much for the lovely review. Welly and I loved all the photos of adorable Poppy Dog. I’m hoping to do 2 new flavours this Spring….. 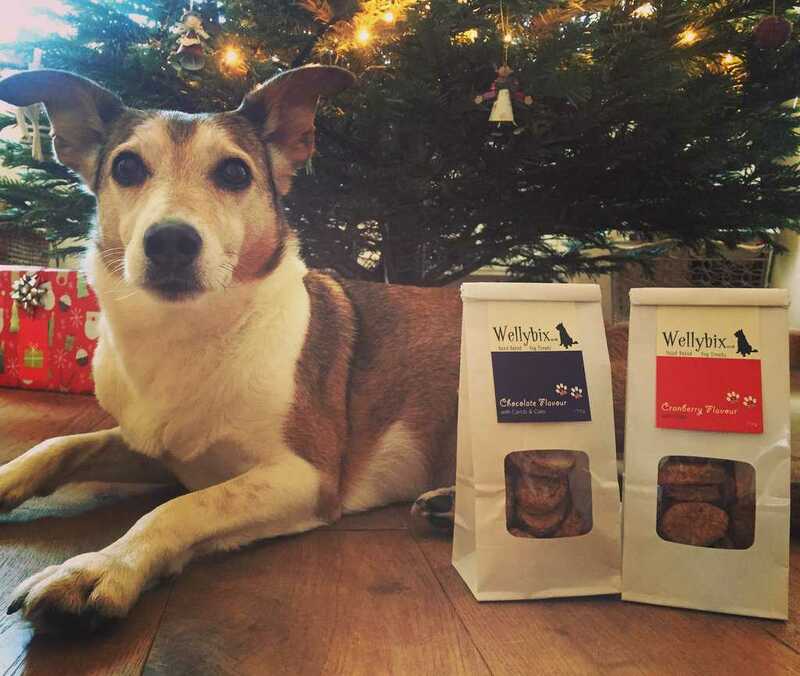 Malted Milk and Oats as well as Honey and Pumpkin Seed….. so will send on some samples to try out when they are done, so Poppy can do a taste test. Thanks again, and have a lovely week.